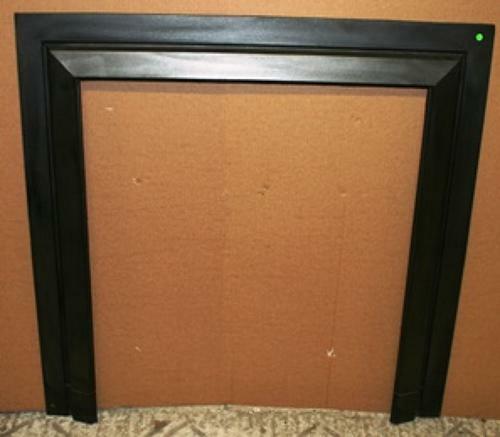 A reclaimed cast iron fireplace / woodburner trim or frame with a classic, simple, design. The trim is designed to fit around a fireplace opening with woodburner or fire basket to give a finished look the fire. The trim has a plain design, suitable for a modern or period home with the outer border laying flat against the fire wall and the inner border projecting outwards. The trim is reclaimed but in very good condition and it has been blacked and polished giving a rich colour and lovely finish. There are some slight casting marks to one corner (please see pictures) and there is a very small area of surface rust on the bottom of one leg. The back has surface rust as expected. A lovely trim that would add a classic and attractive finish to a fireplace.